Cabin was wonderful! Location was great! Plenty of room. I gave it a 8 for check in because there was only one person checking in and several families waiting. I gave it a 9 for check out because I never received a text confirmation that my check out text was received. Will definitely be coming back and using Cabins USA again. This cabin has by far been the best one we’ve booked. We will more than likely come back to it next year if at all possible. 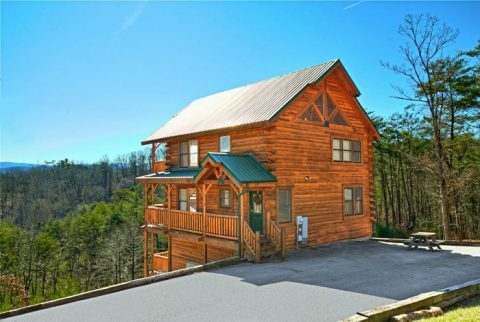 This cabin is in a great location 12 minutes from The Island in Pigeon Forge yet great views of the Smoky Mountains. The cabin is in a dense neighborhood, but there is still plenty of privacy. The only negative with privacy is that the cabin just North can easily see into the third floor since it has a large vaulted window with no coverage. As with any cabin made of wood, there's not much insulation between floors, but the open staircase that connects all 3 floors together made it even harder to have a private conversation as anything said on any floor can be heard on any other floor. The sleeping arrangements are fine, but differ from the floorplan slightly: 1st and 2nd floors both have a King bed in a room and sleeper sofa while the 3rd floor has 2 queens bunks sleeping a total of 4 on each floor. The "4th" floor is not really a floor, it's just a lofted platform over the 3rd floor bathroom, but it has 3 queen "mattresses" laid on the floor sleeping a total of 6. Overall, you can easily sleep 18 people. There is plenty of square footage in the cabin, but the footprint of each floor is MUCH smaller than you would expect as the bedroom/bathroom combo on floors 1 & 2 take up lots of square footage and the remaining space is taken up by sofas, tables, chairs, and games. The 3rd floor, however, has PLENTY of space. We were easily able to fit all 18 of our people upstairs along with a 4-piece band and "tech booth" with plenty of room leftover to move around. This was our first cabin experience for our daughters college graduation. We all had a wonderful time. The cabin was beautiful and clean. No one wanted to leave. We'll definitely be back. We had a great time, the cabin had almost everything needed. The kids enjoyed the pool table and air hockey a lot. would definitely recommend it to our friends and family. The only disappointment was the electric fireplace, which is basically a "fake" fireplace. Would probably not rent this property again in the fall or winter because we really enjoy having a gas or wood fireplace. Also, perhaps a nicer grill, but we made do with the one there. Everything else was perfect! The whole family loved it. We will definitely be staying again. The only problem was it took forever for the hot tub to heat up, but after it did had no problem. Cabin was awesome, best cabin we have stayed at from Cabins USA or any other rental company! Cabin was big and very nice. Location is great, only a few mins off the parkway or from Wears Valley Road. The development where the cabin is, is also very nice, some real nice cabins there. Definitely would stay at this cabin again! Cabins USA is top notch, better than any other rental company we have rented from. We stayed 8 nights and had a wonder experience. The cabin was very clean and comfortable and the location from the parkway was excellent and a short easy drive to be near everything yet get away from it all in just a few minutes. Only a couple of minor complaints and they definitely wouldn’t be deal breakers. The couch on the 3rd floor had no mattress so we had to bring a heavy futon down from the high loft. It wasn’t easy to get it back up there before we left. The washing machine shut off mid cycle a couple of times for unknown reasons. There were not enough blankets available for the extra sofa sleepers. We sprayed wasps nests on 3rd floor deck to be able to use hot tub. We had a guest get stung. With that being said we had a great experience and wouldn’t hesitate to book this property again. Absolutely beautiful place and view. Would definitely go back. It was clean for the most part when we arrived but there was some sticky ness on the floor in some spots other than that was very pleased with the cabin and staff! The cabin is in a great location and it's design allows for the guests to have a great time. The security light facing the parking lot needs repair. Otherwise this was one of the best cabin vacations we have ever had. I would love to stay in this cabin again in future. Our family had a great stay! We will most definitely be back in the future. Cabins USA has a great cleaning service as well. Everything was spotless and ready when we arrived. Recommend it to anyone looking to stay near Gatlinburg. Quick easy drive into town. We absolutely loved our stay! I would rate our stay as 4.5 stars out of 5. The kitchen has a lot of the basics for cooking, but should be reassessed. Only providing one dish cloth and towel and 2 trashbags isn't ideal for a 4 day stay. Also, there is only one big pot and no hot pads. Overall, we improvised in the kitchen and had a great time at the cabin and visiting the area. We loved our stay at Smokies view. The cabin was amazing close to town and beautiful!! It was everything we needed. Cabins Usa made check in and check out super easy with express check in! We will definitely be returning in the future. We loved, loved, loved this cabin!! We’ve book marked it so we can stay again and again. So much comfort. The beds were wonderful and thankfully plenty of towels. Thank you!! My family loved our stay at this location. Will definitely use Cabins Usa again in the future for smokies view. The property was in a great location, quick access to Pigeon Forge. Problem with hot tub not heating up, called the office, had a service man out and fixed the issue the same day. Blinds in bedroom should be replaced. Kitchen stocked well with everything you need. Only thing that would make this cabin perfect is if the fireplace was gas, not electric. Will probably use this cabin again. Visited as a bachelorette getaway for my sister. We all had a blast. Loved the cabin and all the amenities. Had everything we needed to make our stay enjoyable. The view and location were great, only a few minutes from Pigeon Forge and Gatlinburg. Will definitely be back again. Only a few minor issues..
-Issue with the address for some reason, gps said Zachary Thomas road instead of lane and it takes you to Isaac rd when you click on the link from the express check in email. Zip code is 37876 not 37862. -No instructions for the jacuzzi outside so took awhile to figure out how to get it filled up and running. Wonderful staff. Very helpful and polite. Had a few problems arise during our stay and maintenance staff was very quick to respond. Excellent company. Will definitely use Cabins USA in the future. I have been a customer with Cabins USA for the last 10 years. I think that the cabin owners must do a better job with the maintenance of their properties and Cabins USA must demand it due to the prices they charge. Smokies View is a excellent cabin for a family to stay and enjoy the amenities. Here are the items that need corrected: burned out light bulbs, front door threshold very sharp could cut a foot, bottom door on stove will not close, air hockey table needs to be replaced, downstairs toilet will not flush, the dryer timer will not shut off without unplugging the unit, panels need to be replaced on hot tub and upstairs shower leaks in kitchen ceiling. I look forward to a response to this work order request because I would like to come back to this cabin in October 2018 fall break with the grandkids again. Thank you. We had a fabiulous weekend! Cabin was very clean and comfortable. We will definitely be back! Overall great stay, only complaint is there was something wrong with the dryer. Almost every hour the buzzer on the dryer would go off even though the dryer was not in use, very frustrating when trying to sleep. Thank you for taking the time to let us know about your recent stay in Smokies View! We here at Cabins USA strive to give each guest the best stay possible while vacationing in the Smokies. I apologize for the issues you experienced with the dryer. Your comments have been forwarded to our maintenance department to be addressed. When you are ready to stay with us again, please mention you are a return guest for an additional discount. Thank you for choosing Cabins USA and we look forward to seeing you again soon! We had a great time. Air went out on top floor. Once I call they took care of the problem within mins. Will return again!! Thank you for all of your kind words! We here at Cabins USA work hard to make sure each of our guests have the best stay possible while vacationing in the Smokies. Thank you again for your review and thank you for choosing Cabins USA! We had a wonderful experience!!! Have you all considerd giving a cash amount for referrals? You all were referred to me by a family member and it was everything he described. Pray about it and let God be your guide. Hope to share in the joy and excitement in the future. May God bless each of you!!! Thank you for all of your kind words! We here at Cabins USA strive to ensure each of our guests have the best stay possible while vacationing in the Smokies. When you are ready to stay with us again, please mention you are a return guest for an additional discount. Thank you for choosing Cabins USA and we look forward to having you are a return guest again! We absolutely loved the cabin. Plenty of room for everyone. The location was great not to far from all the attractions. The cabin was very clean and comfortable. My only complaint is the couch on the bottom floor needs to be replaced, you fall in a hole when you sit down. But overall we had a great stay! We would definitely recommend this cabin. We look forward to booking with Cabins USA again next year. Thank you for all of your kind words! We here at Cabins USA strive to give each guest the same great stay you enjoyed while vacationing in the Smokies. Thank you for letting us know about the bottom floor couch. Your comments have been forwarded to our Owner Liaisons and they will be bringing this to the owner's attention. When you are ready to stay with us again, please mention you are a return guest for an additional discount. Thank you again for choosing Cabins USA and we look forward to seeing you again soon! Cabin was in a great location near everything we wanted to see and there was enough space for all of us in the cabin. Only recommendation would be to have a bigger pot for cooking with the amount of people we had it was a bit of a challenge when cooking at times. Thank you for allowing us to make such great memories is such a gorgeous place. Thank you for all of your kind words! We here at Cabins USA work hard to make sure each of our guests have the same great stay you enjoyed while vacationing in the Smokies. Thank you for your suggestions. Your comments have been forwarded to our Owner Liaisons and they will be bringing that to the owner's attention. When you are ready to stay with us again, please mention you are a return guest for an additional discount. Thank you for choosing Cabins USA and we look forward to having you as our guest again! We were told the view was exceptional. We were miss led. It was an ok view but not great. Alittle outdated. The bees were horrible. Other than that it was a nice stay. Thank you for taking the time to let us know about your recent stay in Smokies View! We here at Cabins USA work hard to make sure each of our guests have the same great stay you enjoyed while vacationing in the Smokies. When you are ready to stay with us again, please mention you are a return guest for an additional discount. Thank you again for your review and thank you for choosing Cabins USA! It was a great stay! Compared to my last; I will be back soon! I am so happy to hear that you enjoyed your stay in Smokies View! We here at Cabins USA work hard to make sure each of our guests have the same great stay you enjoyed while vacationing in the Smokies. Thank you again for your review and thank you for choosing Cabins USA! Great place to stay with plenty of room. The most comfortable beds I have ever slept in at a rental cabin. Thank you so much for the easy check in and check out process. I will never rent from anyone other than cabins usa again. Some replacements such as broken blinds were needed. Unable to adjust on main floor . Otherwise..... nice place! Hope to come back soon! Thank you for taking the time to let us know about your recent stay in Smokies View! We here at Cabins USA work hard to make sure each of our guests have the best stay possible when vacationing in the Smokies. Thank you for letting us know about the blinds in the cabin. Your comments have been forwarded to our maintenance department to be addressed. When you are ready to stay with us again, please mention you are a return guest for an additional discount. Thank you again for your review and we look forward to seeing you again soon! This cabin and its location were very nice. The young man Brandon at the check in office was very nice and helpful. We had a problem with toilets flushing and backing up on thanksgiving day and the office sent a repair guy out to fix it within an hour or so which was surprising on a holiday. Accessibility to the area attractions was convienant and easy to find. Will deffenanly be planning a trip here again in future. This was a perfect place for our 8 person party. Everyone had a comfortable place to sleep, the kids enjoyed the games and the hot tub, and most importantly the views were awesome. Express check in and out was very convenient and stress free. I am so happy to hear that you enjoyed your stay in Smokies View! When you are ready to stay with us again, please mention you are a return guest for an additional discount. Thank you again for your review and thank you for choosing Cabins USA! Cabin was very spacious and comfortable for our family. Plenty of beds for a large family. The biggest problem with this cabin was window coverings. There was one mini blind missing in the living area, and several had slats missing in them. It was hard to sleep late due to the sun shining in your eyes. In my opinion, I prefer to have window coverings in every room. The bedrooms would be more relaxing if proper window coverings were put up. Thank you for taking the time to let us know about your stay in Smokies View! We here at Cabins USA work hard to make sure each of our guests have the best stay possible while vacationing in the Smokies. Thank you for letting us know about the blinds. Your comments have been forwarded to maintenance to be addressed. When you are ready to stay with us again, please mention you are a return guest for an additional discount. Thank you for choosing Cabins USA and we look forward to having you as our guest again! Our family enjoyed the cabin greatly. It wasn't as new as we were expecting but was still in good condition. We did find a scorpion on the bottom level. The drive to town wasn't bad. We enjoyed being out of all the traffic. Can't wait to go back for the fourth of July, too bad it won't be the same cabin. Deck view excellent, bed comfort excellent, deck and deck furniture poor worn and in need of care. Thank you for taking the time to let us know about your recent stay in Smokies View. We here at Cabins USA work hard to make sure each of our guests have the best stay possible while vacationing in the Smokies. Thank you for letting us know about the deck furniture. Your comments have been forwarded to our Owner Liaisons and they will be bringing this to the owner's attention. When you are ready to stay with us again, please mention you are a return guest for an additional discount. Thank you for choosing Cabins USA and we look forward to having you as our guest again! We loved this cabin. The main level was great for my father, my family of 4 had the top level and the brother's family of 4 had the bottom level. This cabin will be our first choice on our next trip. Everything was clean and we had no issues with a/c or the plumbing. The kids loved all of the towel swans on the beds and of course loved the air hockey and pool table. This was the best cabin that we have rented so far for our multi family vacations. It was a great cabin, in a wonderful location. The only problems were the heat going out in the lowest floor sometime in the night during our last night (when I called to check-out I made them aware) and the fact that there was only one trash bag for a cabin that was supposed to hold 14 people for several days. Thank you for taking the time to let us know about your recent stay in Smokies View! I apologize for the issues you experienced with the heat. Maintenance has been made aware and are correcting that issue. When you are ready to stay with us again, please mention you are a return guest for an additional discount. Thank you again for your review and thank you for choosing Cabins USA! Everyone we talk to with Cabins USA were very helpful. This is a great location and cabin for large groups. Overall our trip was great. The cabin was great but my only complaints were that the hot tub did not work properly and we were unable to use it. The size of the cabin was very misleading from the pictures online and the price we paid. The main floor was a lot smaller than we expected, which is where most of your time is spent (kitchen and living room) One other issue we had was we were unable to put up baby gates on the stairs due to the size of the stairwell. I would definitely stay with CabinsUsa again but not at this cabin. The price per night was a lot higher than what we have stayed in before, but the previous cabins were worth it based on the size we received. Although the cabin was quite nice and suited our needs, the microwave did not work which made fixing meals, especially our Thanksgiving meal, somewhat challenging for 12 people. The microwave did not get fixed or replaced during our stay as it took 2 days before someone even came out to look at the problem. Thank you for taking the time to let us know about your recent stay in Smokies View! We here at Cabins USA work hard to make sure that each of our guests have the same great stay you enjoyed while vacationing in the Smokies and I apologize for the inconvenience of not have a working microwave during your stay. I am happy to report that we have gotten a new microwave for that cabin. When you are ready to stay with us again, please mention you are a return guest for an additional discount. Thank you again for your review and thank you for choosing Cabins USA! We loved the cabin! We played a lot of pool and the sticks could use some new heads but it did not stop us. We had a blast and the cabin was very clean, comfortable, roomy and fun!!! Me and my family really loved this place it was home away from home. The only problem I had was I kinda got lost and pass the cabin. I would highly recommended cabinusa to family and friends!!!!!! One of the best compliments we can receive is when our guests refer us to their family and friends! I am so happy to hear that you enjoyed your stay in Smokies View. Thank you for your kind review and we look forward to having you as our guest again! The cabin was great for my children and grand children. The fire pit was an extra bonus for making smores for the grand kids. The staff was very helpful with all the requests we had. The only thing i had to call about was dog hair on one off the futon beds in the kids loft but the office had someone there to clean it up very quickly. Some of the furniture could be replaced but hey who sits around when you have kids wanting to play pool (which got used the most lol), air hockey, fooseball. All in all staying at this cabin was the best experience we had as a family so far and would like to thank cabins usa for everything they did and had to offer. I would highly recommend anyone to stay at this cabin or use cabins usa. Ohh one of the best conveniences or us was you didn't have to go back to the office to check out, all we had to do is call the office before 11am and let them know we were leaving. Once again if you use this company you will not be dissapointed. I am so happy to hear that everyone in your family enjoyed their stay in Smokies View! We here at Cabins USA work hard to make sure that each of our guests have the most pleasant stay possible while staying in the Smokies. Thank you for your kind review and thank you for choosing Cabins USA! Lovely view! Great cabin with lots of room! Great value for our group and easy check in and out with friendly help. We were told there was parking for only 3 vehicles but we actually parked at least 6 cars with no problem in the drive. Overall great experience and would definitely recommend. The cabin was even better than we had expected. We had 4 adults and 4 kids from 4 to 16 yrs. Plenty of room and privacy for all. The pool table got lots of use. The balconies, hot tub, the view...all were absolutely great! The value was unbelievable. We typically stay in motels and the cabin was so much more...like home away from home. We weren't sure what to expect until we arrived, saw the cabin, and went inside. Again, I cannot say enough about our delight and excitement as we explored the cabin. Bottom line....we loved our stay at the Smokies View cabin, would highly recommend a stay there, and will certainly go back next chance we get. Absolutely LOVED this cabin!!! :) We stayed in this cabin for a week and stayed at another cabin through a different company for a weekend. I definitely liked Cabins USA cabin better. It was an amazing week! I really enjoyed my stay. The negatives were: the pool table was pretty old and there was no chalk. The air hockey table didn't work. I couldn't figure out how to empty and refill the hot tub so we never got in it. The water smelled old. I know this looks horrible but we still had a great time. The beds were comfortable and there was plenty of dishes. We even baked a cake. The view was nice. We would go again. Thank you for your review. We are glad that you had a great stay with us. We apologize for the inconveniences you experienced. Please feel free to call us in the future and we will insure that our maintenance staff will assist you in any way they can. We will make sure this is handed down to our maintenance staff to insure these issues are addressed. Also, our cleaners make sure that the hot tubs are emptied before your stay, if you ever feel as though it needs to be cleaned upon your arrival please feel free to call our office. We will have the cleaner come out to the cabin and drain and refill your hot tub. We appreciate all of your feedback and we hope to hear from you again soon. This was the first time that I ever stayed in a cabin. I was looking for something different to do for an annual leadership retreat for a group that I advise. When my co-advisor and I saw the website, we thought staying in a cabin would be a great idea. We looked at all of the different cabins available and initially selected A Bear-T-Ful-View because it was in our price range. Unfortunately we could not stay there because we had to change the date of arrival by two weeks and that cabin was no longer available. The staff worked with me to find another cabin for the new weekend and made sure that it was in my price range. We actually got a larger cabin with better amenities by staying in Smokies View. WE LOVED IT!!!!!!!!!! I do not think that I can come up with a single complaint about this cabin. It was spacious, clean, comfortable, and had an incredible view of the mountains. It was a little bit difficult to find at first because we got there so late at night and we could not see the name of the cabin, but once we found the right place, we were set! Each floor had its own personality and the group that I took with me quickly decided where they wanted to stay. I know that we were only there about 45 minutes (we had to unpack our food) before people ran to the hot tub. When we woke up the next morning, two or three of us sat out on the deck and watched the sun. It was very peaceful and quiet and calming. I was really happy that we had three bathrooms because there were 12 of us and that helped out a lot. One of our bonding activities was to make s’mores outside so we were thrilled that there was already a fire pit. The only thing we really needed was firewood, but we made it work. Now that I think about it, the one things that was a drawback was the air hockey machine did not really blow air so the puck did not slide across the table well. Aside, from that, everything else was fine. I would recommend that you bring extra blankets if there are a lot of people in your group just in case someone has to sleep on the couch. If you stay in Smokies View, you will not be disappointed. You will love every moment that you are there! Thank you for taking the time to write your review. We are delighted that you had a wonderful experience staying with us. We appreciate your feedback on your stay and experience with our company. We apologize for any inconveniences that you may have experienced during your stay at Smokies View. We will have our maintenance staff address the air hockey table to insure it is working properly. Also, We do provide extra blankets. In the future feel free to call our office and we will do our best to bring you anything you may need. Again we are delighted we were able to provide you everything you needed for your retreat. We hope that we will see you again soon. Do not forget we do offer an additional discount for return guests. This cabin was absolutely beautiful. We took our four teenage children and it was perfect for our needs. Everyone had their own bathroom and there was plenty of space for everyone. We will definitely be back. We loved this cabin! It had everything that we needed for an enjoyable stay. The only thing that I didn't like was the late check in time. I just don't understand why we couldn't be allowed an earlier check in time if the property wasn't occupied prior to our arrival date.. Also, the room on the 3rd floor was like a sauna! We figured out that the ceiling fans were spinning in the wrong direction. Once we changed the switch, it was much cooler. Thank you for your review. We are glad that you loved Smokies View. We do allow our guest to check in early if the cabin is ready. In some cases if the cabin was open the night before we will still have our guest wait until general check-in time at 3:00 pm due to inspections, deliveries, or maintenance work. The summer is our peak season, and most of the time we can only get in the cabins in between check-out and check-ins. We hope that we will hear from you again soon. Do not forget about our return guest discount. We loved our stay in this beautiful cabin. The only minor hiccup was the air hockey tables power cord was broke and some blinds were broken... But trust me when I say this was minor because we were very impressed with the booking process , the staff, And everything else concerning this rental! Will definately stay with cabins usa and definately recommend to our friends and family! Thank you for your review Elana. We are happy that you loved your stay at Smokies View. We apologize for the minor inconvenience you encountered, but I am happy to say that we have power cord has been fixed for the Pac Man game. Also, we have ordered new specialty blinds for the cabin. We hope to see you again soon. My husband and our 3 kids stayed here and we really enjoyed this cabin, it was extremely nice and we had plenty of room. The kids enjoyed the pool table and foosball. I would recommend this to anyone because it is very cozy. We have stay with you for a few years now. Have always been satisfied with the cabins. I always recommend you when people ask. Loved this cabin. The only thing was it was missing a few blinds and the alarm system beeped through the night. (We never miss with setting an alarm) Other than that it was GREAT!! Thank your your review. We appreciate your feedback, and your business. We apologize for the issues you experienced, and they have been taken care of. We look forward to seeing you again soon. A very nice cabin but in need of some small fixes. The bath light fixtures were hanging out of place and some blinds were broken. It was very clean other than a few corners where it appeared dead bugs had been swept and not thrown away. The recliners on the third level were broken. All in all very nice, we enjoyed our stay. Thank you for choosing Cabins USA Molly, your feedback on your stay is greatly appreciated. We will look into the issues you have presented and make sure they are taken care of. We are delighted you enjoyed your stay with us and look forward to hearing from you again soon. Everything was beautiful, great place to spend my birthday. I will spend my birthday here every year!